One of the world’s biggest experiments in democracy will take place in Nigeria on 16 February 2019. More than 80 million voters will head to the polls to choose the next president. As a federation, Nigeria has 36 states and more than 200 different ethnic groups, making elections often fraught with tension. 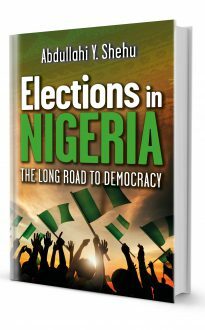 Professor Shehu’s book aims to appraise the practice and progress of democracy in Nigeria and highlight some key issues that have driven electoral choices in the past or are likely to do so this time around. As he puts it, “In Nigeria, experience has shown that whereas every politician seeking election claims to do so to serve the country, in reality, most seek public office to serve their selfish interests rather than the national interest. Conducting an election is a routine activity, but conducting one with integrity is a function of true democracy”.